Web test recording and playback in Google Chrome is made possible by the SmartBear Test Extension. 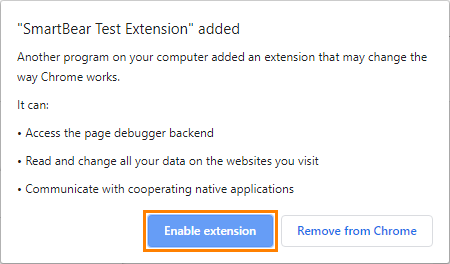 This extension is automatically installed in Chrome during the TestComplete installation, and is shared among all user instances of Chrome. 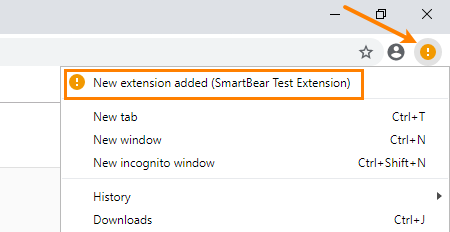 SmartBear Test Extension adds its icon to the Chrome navigation bar - this way, you can confirm that the extension is installed and enabled. The SmartBear Test Extension is automatically installed during the TestComplete installation, provided that Chrome is already installed (either for the current user or for all users on the computer). If you start recording in Chrome and the extension is not installed, TestComplete will suggest that you install the extension from the Chrome Web Store. As an alternative, you can close Chrome and reinstall TestComplete in the Modify mode. After the extension is installed (or updated), you may need to restart Chrome to enable the extension. Chrome may need some auto configuring after the new extension is installed. When the extension is installed to an already running Chrome instance, it may not function unless Chrome is restarted. Launch Chrome. Note that its menu icon (the three “hamburger” lines at the top right) becomes orange. Click the Chrome menu icon and then select New extension added (SmartBear Test Extension). In the dialog that appears, click Enable extension. If your testing environment is deployed automatically and it includes unattended installation of TestComplete, TestExecute or Google Chrome, enabling the extension manually is not an acceptable option. In this case, you can add the SmartBear Test Extension to the list of force-installed Chrome extensions. Learn about the workaround and its limitations. From the Chrome main menu, select More tools, and then select Extensions from the context menu. For detailed instructions, see above. The SmartBear Test Extension provides a number of options to customize web testing recording and playback capabilities. To view or change these options, click the arrow on the left of the SmartBear Test Extension on the Extensions page in Chrome. Allow in incognito - Enable this option to test web pages during private browsing. Allow access to file URLs - Select this option to test local web pages or web pages stored as local files (their URLs start with the file:// prefix). After you change these options, you must restart Chrome. Otherwise, TestComplete will not see web pages in Chrome.